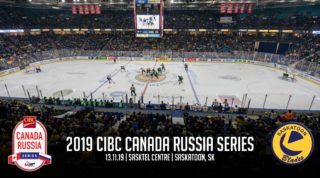 In our sixth of eight opening round 2019 WHL Playoffs previews, we examine the Saskatoon Blades and Moose Jaw Warriors. 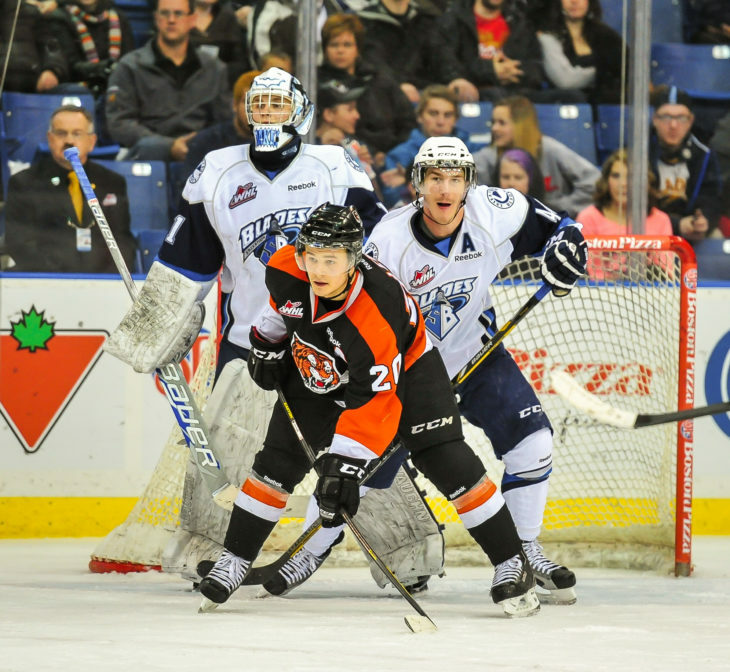 The WHL’s East Division has become a breeding ground for success in recent year. The division has sent a team to the WHL Championship Series in four consecutive seasons, earning two of the last three Ed Chynoweth Cups. Now, the Saskatoon Blades and Moose Jaw Warriors are looking to get in on that trend and continue the division’s success as their own. For the Saskatoon Blades, their return to the WHL Playoffs didn’t involve them sneaking into the final spot available, but surging up the league standings to finish with the league’s fourth-best record and a 24-point improvement over last year’s finish. As for the Warriors, their perfect combination of high-flying offence and steady defence led to their third consecutive 40-win season. Despite the team’s finishing in close proximity of each other in the standings, the Blades owned the season series against the Warriors, winning five of the six matchups. With two of the league’s top three scorers in Tristin Langan and Justin Almeida (Pittsburgh Penguins), the consistent offensive threats of the pair could turn the tide in the series. 2019 NHL Draft prospect Brayden Tracey led all WHL rookies in scoring and joined the aforementioned pair in surpassing the 30-goal plateau. On the Blades’ side they also had a trio of players reach the 30-goal mark with 10 forward in total recording double-digit goals during the regular season. In terms of playoff advantages, the fresh start for the Blades could either be a wake up call or the start of more success. Five seasons out of the playoffs have seen the roster cycled through in that time and no bad elimination memories from the WHL Playoffs exist. Missing out thinly on reaching the post-season last year certainly stung, but the Blades are full of cautious optimism as they embark on a new journey. In the Warriors’ corner, they’ve qualified for the WHL Playoffs for a fourth-consecutive season. However, they’ve only gone as far as the second round, losing to the eventual WHL Champion each time. In NHL circles, the Warriors have plenty of talent to offer up to keen watchers. Captain Josh Brook is a prospect of the Montreal Canadiens while Almeida recently signed a three-year, entry-level contract with the Pittsburgh Penguins, who selected him at the 2018 NHL Draft. The same goes for Vancouver Canucks prospect Jett Woo, who is another talented member of the team’s blue line with Brook. Though they have just the one prospect on the NHL Draft radar, Tracey’s talented rookie campaign has scouts looking for his next brilliant move. The last pick in the 2018 NHL Draft, Washington Capitals prospect Eric Florchuk put together a solid 50-point campaign with 21 goals for the Blades. Another Capitals prospect in Kristian Roykas Marthinsen also had strong showings in his first season with the Blades. 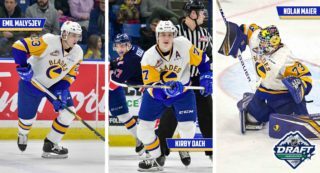 On the NHL Draft radar, the Blades will showcase a strong talent in Kirby Dach. The second-ranked skater in North America, Dach has only continued to raise his game and NHL teams will be watching to see how he’ll thrive in the playoff-atmosphere. Also on the NHL Draft radar is Emil Malysjev. Though he’s not ranked as high as Dach a 17-point campaign from the Swedish product as a 17-year-old provides promise for the future. 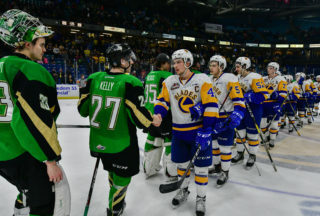 The fun gets underway Friday, March 22 (7:00 p.m. MT) as Game 1 on the best-of-seven series is held at SaskTel Centre. After Game 2 Saturday, the series will shift to Mosaic Place in beautiful Moose Jaw, Sask. and Game 3 on Tuesday, March 26 (7:00 p.m. MT). For the first time since 2003, the @BladesHockey & @MJWARRIORS will meet in the #WHLPlayoffs! Be patient and confident: Since their first-round exit in the 2013 WHL Playoffs, the Saskatoon Blades players, staff, and fans have yearned for a return to the big dance. Now that it has happened, the trick is pretending to play like you’ve been there before. Small mistakes and errors can get magnified and exposed over the course of seven games. The Warriors wouldn’t be the first, or the last, third seed to take down the second seed and the Blades need to recognize that. Instead of trying to reinvent their approach, the Blades simply need to analyze what went right against the Warriors in the regular season and how to ensure they do that again over the duration of the series. The Blades ranked fourth in the WHL for goals for and goals against, showcasing their impressive commitment to both sides of the puck. As much people will say the season series doesn’t matter when the puck drops in the playoffs, the Blades still won those games for a reason, something the team and its fans need to remind themselves of if things don’t go well immediately. Trusting your team: When teams talk after drafting and developing from within, they need to look no further for a model example than what the Warriors have done. Knowing to select two cornerstone defencemen in captain Josh Brook (Montreal Canadiens) and Jett Woo (Vancouver Canucks) with the fourth-overall pick in the WHL Bantam Draft is one thing. Being able to find your leading scorer, Tristin Langan, with the 183rd selection in the 2013 WHL Bantam Draft is another. For good measure, the Warriors picked up Adam Evanoff with the 219th selection in the 2015 WHL Bantam Draft. Utilizing both of those talents has led to a roster with strong potential. 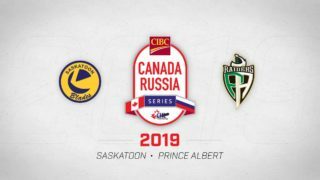 The Warriors surged at points throughout the season, but ultimately faded to third behind two strong teams in the Blades and league-leading Prince Albert Raiders. If the season series against those two teams showed anything though, it’s that when the Warriors are clicking, they pose a real threat to those ahead of them in the standings. A lopsided season series aside, when you get into a seven-game duel with your season on the line, the Warriors can be confident in having talent to take them to the next level. The @penguins have signed @MJWARRIORS forward @justinalmeida27 to a three-year, entry-level contract! Max Gerlach (42-34–74): Josh Nicholls and Matej Stransky are the answers to a trivia question Max Gerlach can now share in. In the 2012-13 season the pair of Blades were two of the team’s key offensive options, scoring 47 and 40 goals, respectively. Since then though, no player has reached that 40-goal mark until Gerlach did so in the final week of the regular season. The Flower Mound, Texas product was part of the return in a three-way trade that saw them deal Libor Hajek to the Regina Pats at the 2018 WHL Trade Deadline. Since then, the former Medicine Hat Tigers has scored 61 goals and racked up 109 points in 98 games. In the 2017 WHL Playoffs with the Tigers, Gerlach fit right in with five goals and nine points in 11 games. The Blades will fairly expect him to be one of their leaders on offence as he was two season ago with Medicine Hat. Five of Gerlach’s 42 goals this season came against the Warriors as he notched a pair of two-goal games with once in each rink for good measure. As part of his team leading eight points (5G-3A) in six games, he made his way onto the score sheet in five of the six contests. The lone game he was held scoreless in just so happened to be the Warriors’ lone win against the Blades this season. Max Gerlach SNIPES his 40th. Tristin Langan (53-60–113): With an offensively-gifted forward core, it only makes sense to start at the very top with overage forward Tristin Langan. The pride of Swan River, Man. came with seconds of earning a share of the Bob Clarke Trophy as the WHL’s Top Scorer. It certainly stings in the short term, but there’s no reason to discount any of Langan’s accomplishments. From his 13 multi-goal games and four hat tricks to his nine points (6G-3A) in six games against Saskatoon this season, Langan has found success each time he’s touched the puck. Now would be a good time to also discuss the 11 game-winning goals he had, finishing tied for the league lead with teammate Brayden Tracey and former Warrior teammate Vince Loschiavo now of the Edmonton Oil Kings. If you took away his points on special teams, he’d still finish in a tie for 17th in WHL scoring and third among Warriors’ skaters this season. If the Blades can’t effectively execute a strategy for shutting him down in the series, home-ice advantage could swing quickly to the visiting Warriors. Dawson Davidson (13-62–75): Finishing tied for the scoring lead among WHL defencemen, the argument could be easily made that the Blades wouldn’t be where they are without his contributions this season. Like Gerlach, the acquisition of Davidson was part of several smart moves by Colin Priestner that has paid dividends for the club at little or no cost to the future. Likewise, Davidson has found a home with the Blades as the Moosomin, Sask. product closes out his WHL career in his home province. Blades fans got a taste of his talent last season as he recorded 16 points (3G-13A) in 26 games. Combined with his totals from this season, Davidson is up to 91 points (16G-75A) in 94 games. With five points (3G-2A) in the season series, Davidson will be a key piece in the Blades’ success for the entirety of their run.
.@BladesHockey defenceman @Davidson_98 has been named the CHL Player of the Week! Josh Brook (16-59–75): While we’re comparing high-scoring defencemen, Warriors’ captain Josh Brook also deserves attention. Brook, who tied with Davidson for the aforementioned WHL defensive scoring lead, has found another element to lead the Warriors’ defence this season. As part of the aforementioned off-season of changes, the Warriors’ blue line wasn’t spared with the departures of Kale Clague, Oleg Sosunov, and Dmitri Zaitsev. Still, the Warriors have actually improved defensively under Brook’s captaincy. The 2018-19 Warriors allowed 24 fewer goals than they did in 2017-18, though the improvement of other clubs saw them slip from fourth to fifth in terms of goals against. With Brook on the ice, this series will be far from a cakewalk for the Blades and the Roblin, Man. product can easily become a x-factor throughout the series. Nolan Maier (53 GP, 36-10-6-0, 2.64, .910, 4 SO): In response to those wondering if Maier could replicate the success from his rookie campaign, he posted 36 wins. Since the beginning of his rookie season in the 2017-18 campaign, Maier is one of three WHL goaltenders, including Ian Scott and Griffen Outhouse, to record 60 regular season wins over that span. There’s no doubt the Yorkton, Sask. product is talented and the Blades look like a more confident team with him in net, knowing he can bail them out at a moment’s notice. His skills have yet to be tested in the WHL Playoffs and while all that is different is the day of the week, the pressure can be daunting to some. Still Maier has proven himself to be worthy of being just on the edge of the conversation about the league’s top goaltenders, amassing a six-game winning streak heading into the playoffs. An excellent debut in the WHL Playoffs will only serve to enhance his reputation throughout the league. Brodan Salmond (37 GP, 21-10-4-1, 2.73 GAA, .906 SV%, 2 SO): Where the Warriors struggled to find success against Saskatoon, overage goaltender Brodan Salmond found it, albeit briefly, earning his team’s lone victory in the season series. That win came on December 7, 2018 on the Blades’ home ice, a positive as the Warriors will need at least one victory away from Mosaic Place to take the series victory. Salmond reached the 20-win plateau for the first time in his WHL career, posting a respectable 2.73 GAA and .906 SV% over 37 games this season. Ten of those victories came against playoff-bound teams. If the Warriors are forced to make a swap, there’s no shame in inserting Adam Evanoff between the pipes either. After a strong rookie season on a defensively-minded team, the 19-year-old from Penticton, B.C. posted career-best totals in wins, GAA, SV%, and earned the first shutout of his WHL career, though he had his own share of struggles against Saskatoon. The Warriors will need their goaltenders to be at their best when the puck drops for Game 1. Ask any fan of the Saskatoon Blades and they’ll walk you through the pain of five consecutive seasons on the outside of the playoff picture. The core that has made this year’s triumphant return to the WHL Playoffs was the same that came within points of a spot last year. Heading into what fans are hoping is a significant run, expectations for the group are foggy at best. They’re certainly talented, but there’s no real benchmark to fairly compare what the team has accomplished this season. For now, Blades fans are eager to let the good times roll as long as possible. When the Blades were founded, they set an early precedent, qualifying for the WHL Playoffs in 11-straight seasons with three trips to the WHL Championship Series. Similar runs in 1992 and 1994 have resulted in the Blades continuing their search for their first Ed Chynoweth Cup. This year’s version of the Blades check all the boxes successful teams have in the past, but seeing if the Blades can win their way out of the fierce East Division will clear up their future quickly. Qualifying for the WHL Playoffs in four consecutive seasons and in 18 of the past 23 seasons, the Warriors are no stranger to the WHL’s second season. They’ve reached the WHL Championship once in 2006, but were swept at the hands of the Vancouver Giants. The Warriors have been no stranger to success in the regular season with four division titles since the 2003-04 WHL Regular Season, but it hasn’t translated to spring success. The Warriors have a strong track record of drafting and developing players to be ready for the professional game. 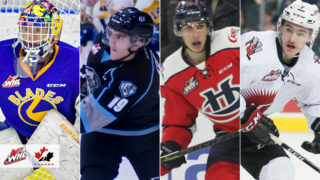 Being able to boast the likes of Brayden Point, Deryk Engelland, Brett Howden, Morgan Rielly, and Ryan Smyth along an ever-growing list, the Warriors’ contributions to the WHL through four decades are immense, but the desire to cap it all with a WHL Championship awaits. With another talented group of NHL prospects ready to represent the Warriors, is this year the year they make a large push? 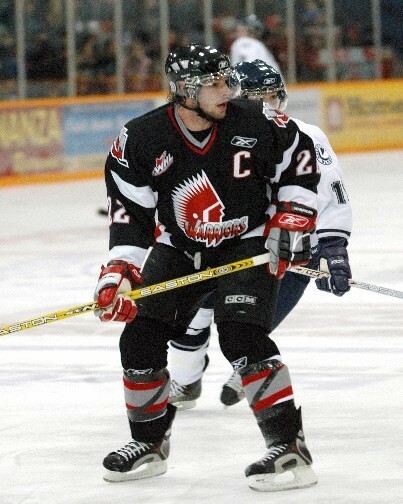 Future NHLer Troy Brouwer was captain of the Moose Jaw Warriors when they last made it to the WHL Championship Series in 2006.